The serious Cubists, once they had rejected perspective unity by multiplying the viewpoints, did not seek to transform into a premature freedom what was for them no more than a method of working and of engaging in further investigation. They did not confuse what was only provisional with something definitive, which would have been - and was for others, as we have just seen - very dangerous. Very cautiously, they tested the exact worth, in terms of objective, formal values, of the plurality of points of view which was what had now become characteristic of the subject. And that led some of them to notice that the plasticity of the picture derived, not from the dispersed elements of the subject, but from the, in a sense unavoidable, way of working which had had to be adopted if these elements were to be coordinated in a logical manner - a network of plane areas, vertical and horizontal, sometimes inclined to the right or to the left, defined by lines. These networks of harmonious lines, arranged following definite, measured relations, enclosing the different extensions defined on the plane of the canvas, seemed to them to be much more real, pictorially, than the fragments of anecdote portrayed as figures which had, both directly and indirectly, given them birth. 'The mysterious effects of line and colour ... that musical and arabesque aspect ... which for many people is nothing' - certain painters were, finally, beginning to have the notion of its internal mechanism, a notion that had escaped their predecessors, masters of colour, but prisoners of the classical outline and of the illusion it had provoked of a third dimension. It now remained to unravel the laws of this mechanism. We had had a very clear intuition of the autonomy of the painting as an object in itself. 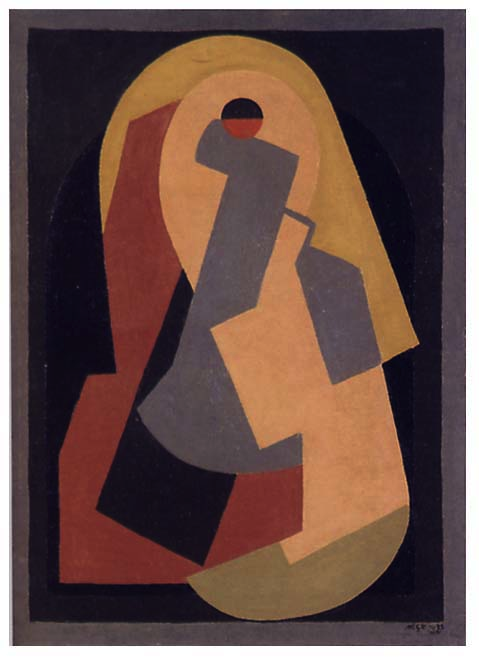 Jean Metzinger and myself had expressed it in 1912, in our work, Du Cubisme, but we honestly admitted that we were not at that point capable of realising it. We warned against the temptation to go too fast; we refused to entrust the future to a throw of the dice. The hour came in the normal course of events, bringing with it those clarifications that were necessary for realising the painting-object, its laws and the infinite variety of possible combinations it allowed. If the subject did not disappear completely once all our attention was turned towards the object, it was because, even after it has been formally renounced, it is hard to break free of a habit. It holds on, and to such an extent that it is prepared to behave in a very discreet manner, if only it is allowed to remain. And that was what happened. The network of lines and zones, vertical, horizontal or inclined, became the structures of the picture. A picture that is flat, through the nature of the canvas, and which remained so in its structures. The subject adapted itself to the discipline of this reality, and its representation took on the character of a sign and no longer that of an imitation of things as they are perceived by the senses. A tacit agreement between the object , master of the house, and the subject , as domestic servant, reconciled what was real with an image which was now no more than an allusion, with a rather hieratic quality. It is certain that this sort of integration of the subject in the object, which did not in any way alter the reality of the thing in itself, had at that moment no other end than to maintain, if only in effigy, the presence of the subject - a convention which we did not renounce. I insist on that, emphatically. But I would also take this opportunity to add that, by an interesting turn of events, when the possibility of realising a painting object without any interference on the part of the figurative element was fully realised and it was then necessary to consider the complexity of the field that had been opened up, and to respond to needs which it was impossible to avoid, such as that of iconography, at that point this integration of the subject to the object to the end I have just described - the maintenance of the image - began to occur of its own accord, but under the control of reason, and in the opposite direction: the reintegration of the subject without falsifying the nature of the object. As one can easily imagine, if the intentions were different, the practical realisations were very similar in their superficial appearances. It is, however, good to be able to say that, from this point onwards, these efforts, instead of being empirical, were becoming methodical, intentional. We will return to this again, shortly, when we come to discuss this problem of figuration which the new, hastily flung together, groupings tend to reject with the battle-cry: 'down with the subject!' For the moment, it is just a matter of a misunderstanding based on the confusion between the classical appearance - a spectacle without any consciousness of form - and a figurative suggestion that can be integrated into the traditional form. It is a confusion from which only ignorant or misled painters, or fishers in troubled waters, can hope to derive any benefit. What had to happen happened. The brief moment of agreement between subject and object of which I have spoken could not last. The reality had to appear, free from all concessions to the remains of Humanism which, in spite of their submissive and retiring character, were not able to disguise their origins. So true it is that, when two lines start out from opposite directions, there is always a point at which they meet. Our good instincts have need of a clear head at that meeting point if they are not to lose their way. The reality of the structures won the day, finally and categorically. The verticality and horizontality of the lines, following the sides of the flat canvas; the inclination on the axis of this plane, which had derived from the substitution of plurality for perspective unity - these now declared themselves to be the laws of the objective drawing, of that 'total image' which had been sought, wrongly, in the subject, but intuitively felt and realised in the object. 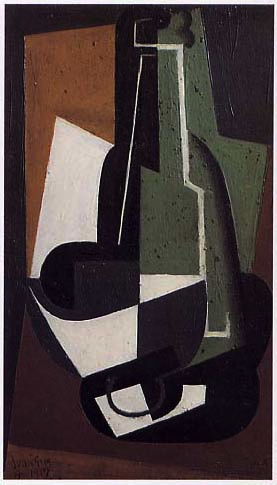 Jean Metzinger and Juan Gris were the first to deduce from what had been revealed experimentally the theory it implied in logic. Shortly after them, for my own part, I tried to formulate it in my little work: Painting and its Laws: What Should Come out of Cubism. This was the period of the first objective paintings, paintings which derived their reality, and therefore their justification, uniquely from what we thought - improperly - were the 'capabilities' of the flat surface. That flat surface had, since the Renaissance, been considered as having no value in itself, as being uniquely the screen on which appearance-spectacles could be projected. It was the appearance-spectacle which, reproduced with paint-brush and paint, was what painting meant for nearly everyone. The so-called 'capabilities of the plane' I named as verticality and horizontality - translation of the plane; and - turning round the axis - rotation of this plane. The consequences of the Renaissance were altogether done away with, and the painting-object was now based upon nothing other than its own laws and its own nature. With these fundamental, simple, and usable elements, the revolution in drawing - form - had found a solid basis. Good intentions, and talent at the service of fantasy, were now relegated to the status of preliminary exercises. Painting was now definitively its own master; non-figurative, objective painting without a subject was no longer an aspiration; it freed the painter, but not by throwing him into the liberty of disorder. It demanded, on the contrary, that he become conscious of order, that he come to her humbly, that he learn through his work to conform to her living rhythm. How were the first painting-objects received and appreciated? I can reply from first-hand experience. While the use of 'translations' and 'rotations' clearly did not yet allow for the production of definitive works - it was still too soon to dream of producing a masterpiece - still, it was already capable of invoking 'these mysterious effects of line ... this musical and arabesque aspect' whose value had been well sensed by Eugene Delacroix. But, as he had bitterly remarked, 'for many people, it is nothing' . The first painting-objects were indeed nothing for the surrounding world, including, with some rare, and for that reason, precious exceptions, those who professed to be critics of art. Also, for the great majority of painters, busily defending 'their personality', making use of the humanist subject. The works were nothing, but they were something all the same, and the future was obliged to admit it. That future is today's present, which admits the legitimacy of non-figurative painting, even if it is unable to make, with regard to it, an honest indictment of the elements of disorder in favour of order. A little further in the future, and this judgment will be made, there can be no doubt of it. It would be ridiculous to ask non-figurative painting, which is, in its positive aspect, the painting-object in itself, to be nothing more than the product of a psychological delirium, when the pseudo-painting of the humanists was able to justify itself by appealing to the authority and power of what it understood to be 'reason'. The painting-object is certainly more reasonable in the real sense of the word than that which it replaced. Its reason is not that of a man abandoned to his reflexes by an eye fixed on distant appearances, but of an eye that is acting under the authority and power of Man, who endows it with his own internal movement. Total man, total painting. Let us pause for a moment to reflect upon and attempt to summarise the state in which Cubism found itself at the moment when the rupture with the state of mind of the Renaissance, with Humanism, was complete. A rupture which was the consequence of a series of experiments which had been pursued with much prudence in the studio and which had finished in a complete reversal of what had previously been the recognised position of the painter with regard to his work. No longer did he occupy the position that had made of him a commentator, a sort of designer of naturalistic scenery, a man at the mercy of appearances as they are recorded by the senses, a Narcissus, stopped in front of a reflection of his own image. He now occupied a position which, from that point onwards, would restore to him his place in the world, his nature, his role, which would engage his full responsibility and would give him the means to come to a knowledge of himself through his own objective action, which would make of painting a reality in itself, image and resemblance of Man. Man's song, in sum, once again considered to be more human than the representation, even the idealised representation, of his physical appearance. Of course, such an outcome had not been foreseen at the time of the first manifestations of Cubism. I have shown that, far from wanting to break with Classicism, the Cubists wanted, rather, to restore its basic principles. But, as, above all else, they wanted their art to possess a truly plastic character, it did not take long before they saw that the spatial volume they were emphasising was far too heavily dependent on a mere trompe l'oeil. The researches continued, still concentrating their attention on the subject, which was taken apart and analysed through the plurality of points of view. The method that had been adopted brought out the contradictions that there were between the subject and the object; and the conditions required by the latter in relation to the plane of the canvas began to appear, without having been envisaged beforehand. The successions of points of view also suggested to those who were engaged in the experiment the idea of time, a capacity that had been refused to painting ever since the adoption of perspective unity. The idea of presenting the subject, following a series of different, successive, appearances seen from different points of view, implied an essentially cinematic, discontinuous idea of time. Once the painters had rejected it, they found the mobility of the painting in the inter-relations of the structures themselves. It appeared as a series of cadences whose numerically based succession established a time that was able to flow, that was at once both supple and continuous. Every trace of the subject vanished. It was now possible to establish a theoretical formulation of the two principles which had to be respected if the painting-object was to be built. These were translation, entirely limited to relations in space, which modified the figures and the different magnitudes that corresponded to the nature of the plane-canvas; and rotation, which instigated the movement of time that determined the order of succession and the direction to be followed by the cadences and, at the same time, gave rise to the particular, unified form in which the overall rhythm of the painting could be fulfilled. That is where the researches of the Cubism of 1910 had led. The Renaissance mode, under which painting is dominated and determined by the subject, was replaced by the traditional mode, which gives painting its own autonomy through the full recognition of the means that are natural to it.. Painting is painting, and painting does nothing other than sing the nature of Man through the intervention of the painter. It becomes once again a craft, like any other - a craft which must be learnt so well that its rules pass into a higher automatism, after which, if it seems that the rules have been neglected, the neglect is only apparent. It is the proof of a real mastery of the means. After the conquests which our masters had made over colour, then, their negligence, or the timidity of their efforts, with respect to drawing, was, happily, resolved around 1920. This, of course, was no more than a beginning. Much still had to be developed, much else remained to be discovered, but this beginning was a true beginning. And the ground to be worked was solid; all the literary parasites were kept out of it - it could only be held by people seriously interested in developing their craft. As for the exhibition-going public, that consisted of those 'few adepts, alas! who can feel those mysterious effects of line and colour ... that aspect of music and arabesque that for most people is nothing'. Delacroix and Baudelaire would not have hesitated to recommend the effort required finally to see and to taste fully those harmonies of line, games of cadence, this music and arabesque (which is what drawing is when it is concerned with the overall form of the painting), instead of remaining fixed in that lazy attitude for which painting can only be understood through being confused with the sentimentality of subjects, through reflexes which turn us away from its real poetry. I must add to what has already been said an event of capital importance which took place several years earlier, around 1913, and whose full, deeply moving, significance must be understood. It shows what continuity there was in this effort, and to what extent we can feel a sense of the inevitable governing the succession of events. We owe it to that turbulent genius, Robert DELAUNAY. 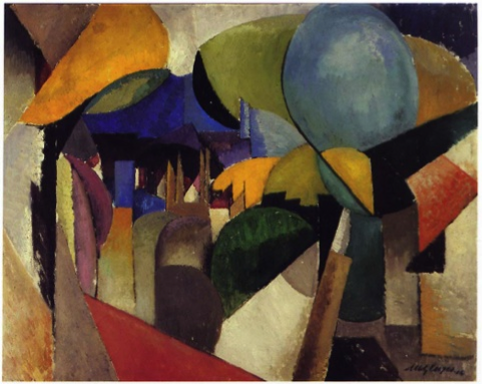 Too essentially lyrical by temperament to confine himself to a patient, critical, experimental work, Delaunay had little enthusiasm for the enterprise which we had undertaken with regard to drawing. He devoted his attention to colour, and, profiting from the victories won by his predecessors, he added another, of decisive importance: the use, for its own sake, as a moving reality of colour, of the chromatic circle, or, if we want to sum it up in its entirety, the rainbow. Yet another of Delacroix's presentiments realised! Delacroix had retrieved it and put it back onto the painters' agenda. Sérusier and the Divisionists had used it, but they had only seen it as a guide to establishing different harmonious relations of colour. Delaunay understood its real nature, and proclaimed it as the key to melody and to its modulation. His works are the proof. This was an enormous discovery, and it was only years later that I, personally, was able to appreciate it. For that is how it is. Yoked together in the same researches, strictly of interest to painting, we pursued them, each of us, by different routes, though coming together to a single conclusion - the reality of the painted work. Delaunay did not see the sense of our work, neither could we see the sense of his. Once the drawing was integrated with the colour, the cadences began to take on flesh, the flesh of the painter; so, the colour had to be unified with the drawing, with its harmonies, its melodies, its counterpoint. How could the chromatic circle in the form of the rainbow fail to assume its full living value? 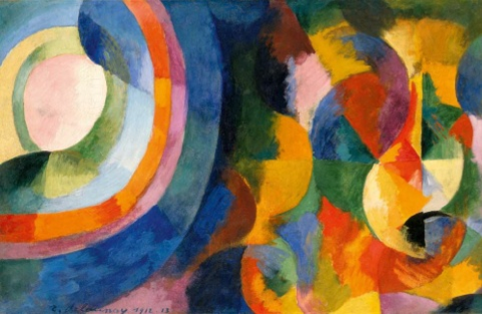 How could Robert Delaunay fail to appear in his real nature, as a precursor? A precursor whose life had been devoted to further developing the work of those who had gone before him?